What’s the last purchase that you made? My Answer: The last thing I purchased? Perscription Glasses. What color do you feel today and why? I feel pink. I'm in a girlie, chatty kind of mood. 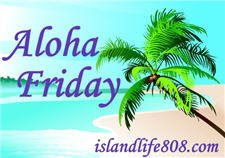 Maybe it's all the "blog newness"
For more Aloha Friday, Click HERE. navy blue...must be from all the scuba diving stuff i've been reading. hmmmm....red! Not sure why..but that is what i'm going with! What color would sniffly and sick be? Green? Hmm that's what I'll go with... HA! Kind of a pale muted grey. I think I'm still half-asleep and getting over the worst cold. UGH. By the way - I love the new digs! i love the new blog! Way cute!!! orange-I know it's random! I think because I've really been "blue" the last few days, but this Aloha Friday has boosted my spirits. I can't say I've made it to yellow, so orange seems on the way to yellow! Oh geez, I'm never one color all the day through but at this moment I would say I'm a pale yellow. Wow the other "just Jen" blogger freaked me out for a minute! Purple! I try to always feel purple-y! I had a happy day, yellow or maybe pink. Seamist blue. Maybe because it's the color of the new towels I just purchased. Anyway, it's a very calm and fresh color. Purple. Not quite excited enough to be red or yellow, but I'm not feeling blue or black by any means. Gray. I've been feeling so blah today. I dunno. Is blurhhhhhhh a colour? Probably blue, red and black all mixed together. I feel like Yellow today - it is sunny and warm outside (the first time in awhile), and it puts me in a spring time mood!